Apple Tree B&B is a Guest House hotel in Broadway; the heart of the Cotswolds, England. It is 4 Star accommodation located within easy walking distance of the village with car parking and WiFi. 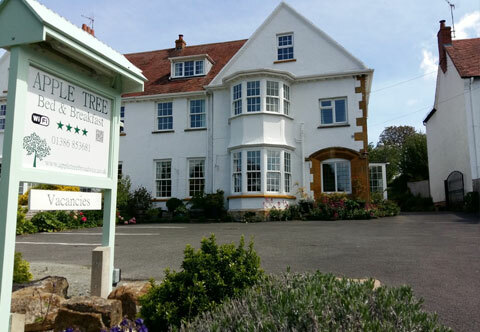 Apple Tree B&B offers quality bed and breakfast accommodation for a holiday or short break in the Cotswolds. There are 8 guest bedrooms, all with en-suite or private facilities, and free Wi-Fi is available. 2 twin bedrooms with en suite showers, 3 double/king bedrooms with en suite shower rooms, a double bedroom with a bathroom en suite, a single room with private facilities and a Family room en suite for 3. Guests can enjoy a Breakfast which includes cereals, fruit and yoghurt, followed by traditional cooked breakfast, with vegetarian option available. Extensive garden with a variety of fruit trees is available for guests' enjoyment.